Low calorie AND 16p per serving? 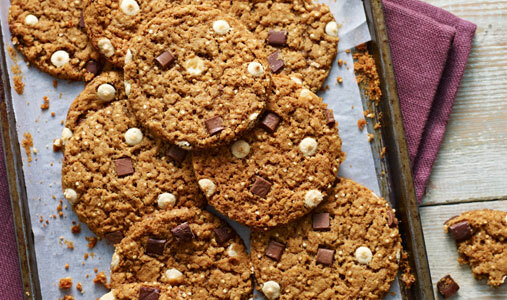 These chocolate chip cookies are almost too good to be true! Dig in! 1. Line a couple of baking sheets with baking parchment. Put the butter, cocoa and coffee in a medium saucepan then heat gently until the butter has melted. Remove from the heat, stir in both the sugars, then leave to cool. 2. Chop the chocolate into small pieces. Beat the egg and vanilla into the cooled butter mix to make a smooth batter. Stir the flour and bicarbarbonate of soda together. Tip it into the batter mixture with two-thirds of the chocolate, then gently stir together to combine. Leave for 10-15 mins to firm up slightly, ready for shaping. Heat oven to 180C/gas 4. 3. Using your hands, shape the mixture into 22 small balls. Lay them on the lined sheets, well apart so they have room to spread (you may have to bake in batches). 4. Press the rest of the chocolate pieces on top of each cookie. Can be frozen on sheets and then transferred to bags at this stage for up to 1 month. Bake for 12 mins. Leave on the sheets for a couple of mins, then transfer to a cooling rack. Why not enjoy with a cocktail?